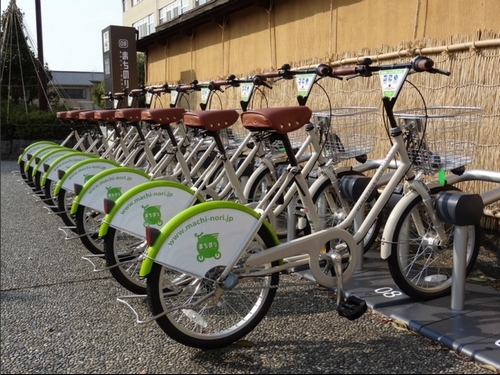 The Japan Tourism Agency (JTA) announced on September 28, 2012, the approval of four projects regarding innovations on local tourism, including "Developing Tourist Mobility by Utilizing Municipal Bicycle Rental Service 'Machi-nori (town-ride in Japanese),'" that offer Innovative Services for Regional Tourism in Kanazawa City. To pursue attractive tourism activities in response to the diverse and changing needs of tourists, JTA has publicly offered to support projects to further enhance attractive destinations. Analyzing the achievements and problems of its nationwide application, JTA plans to apply the results to other destinations. The other three projects selected from 61 nominees are "'Kitakami Chari (bicycle) Hour' for Health Creation Project" (Kitakami City, Iwate Prefecture), "Development and Disclosure of Standardized Information Structure for Experience-based Tourism, Utilization of the Structure for Search, Registration and Collection of Data of Events, and Effective Keyword Selection System for Ad Words" (by Kakeyu Hot-Spring, Ryokan and Hotel Association in Ueda City, Nagano Prefecture) and "Creating Ubiquitous Information Service to Promote Mobility in Dogo Onsen Area" (Matsuyama City, Ehime Prefecture). Examination standards include whether the project is designed for cooperation between business operators and local people, and whether the profits are returned to business operators, as well as to the wider community.